Our second match in the second round of Bracket Seven of the Battle of the Books, features the match-up of The Doctor and the Rough Rider by Mike Resnick versus River Road by Suzanne Johnson. The winner will be the book I (Amy) most want to continue reading after 50 pages. 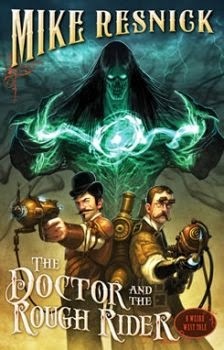 The Doctor and the Rough Rider: Pyr Books, December 2012, 304 pages, cover art and interior illustrations by J. Seamas Gallagher. Mike Resnick is the award winning author of over seventy novels and over two-hundred and fifty stories, and the editor of over forty anthologies. This is Resnick's third book in his ongoing A Weird West Tale series. The Doctor and the Rough Rider reached the second round by defeating werewolf horror book, Wolf Hunter by J.L. Benét. In The Doctor and the Rough Rider, the United States, as a nation, has been prevented from expanding west to the Pacific by an Indian medicine men spell, although many miners, settlers, and farmers have been allowed past the Mississippi. Geronimo tells Doc Holliday that he wants to make peace and that he is willing to negotiate an end to the spell with one man: Theodore Roosevelt. But Geronimo knows that many Indians won't want the spell lifted and they will try to kill him and those who stand with him. Bat Masterson goes to young Theodore Roosevelt's ranch in the Dakota Territory, on Holliday's request. Masterson asks Roosevelt to travel to Tombstone to deal with Geronimo. Roosevelt is excited to go and help fulfill America's destiny. Doc Holliday arrives in Tombstone from Leadville. He chats with inventor Thomas Edison, who was sent to the West to try to break the Indian spell. Holliday asks Edison to produce something to help Geronimo and Roosevelt's cause. Roosevelt and Holliday ride out into the desert to Geronimo's lodge for negotiations. 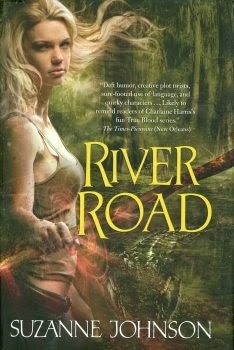 River Road: Tor books, November 2012, 332 pages, cover art by Cliff Nielsen. River Road is the second book in the Sentinels of New Orleans series. River Road reached the second round by defeating paranormal romance, Guardians of Stone by Anita Clenney. In River Road, we learned that after Hurricane Katrina, unbeknownst to almost everyone, historic undead and other preternaturals flooded into New Orleans. Drusilla Jaco, aka DJ, a Green Congress wizard, and her co-sentinel, the shapeshifter Alex Warin, are employed by The Elders to handle paranormal problems. Historical undead pirate Jean Lafitte, who finds DJ attractive, has asked DJ to negotiate a truce between two clans of feuding merpeople. DJ, Alex and Jean Lafitte met up at DJ's small strip mall office. Lafitte tells them the restaurant in Plaquemines Parish where the merpeople clan representatives have agreed to meet. DJ drives the red Corvette which Lafitte arrived in, because Lafitte desperately needs driving lessons. Alex follows in DJ's SUV. When DJ realizes that Jean Lafitte, being a pirate, stole the Corvette, they abandon it. Alex drives all of them the remaining way to their rendezvous. The mermen are Cajuns. First they met Lafitte's friend, the tattooed Rene Delachaise, and his twin brother Robert. The other merman, Denis Villere, who is older, arrives on motorcycle. After a couple hours of arguing while eating a seafood lunch, they come to a tentative agreement on clan territory borders, contingent on solving the untested water contamination problem. The Battle: This match-up features a Wild West steampunk book going up against an urban fantasy book set in New Orleans. The Doctor and the Rough Rider uses famous historical figures as characters. They banter and point out each other's exceptional talents. Doc Holliday calls Edison "our greatest genius". Theodore Roosevelt acts like a fanboy about meeting Geronimo, Doc Holliday, and Thomas Edison. There are signs of upcoming conflict between those who want to end the barrier spell and those who don't. Although several women have been mentioned (plus "metal harlots"), no female character has yet made an appearance in The Doctor and the Rough Rider. In River Road, on the other hand, there's tension between the characters. Alex and Jean Lafitte hate each other, and DJ is caught in the middle. Lafitte humorously calls Alex, the shapeshifter, Monsieur Chien or Mr. Dog. The feuding merman dislike wizards, and DJ threatens them with her elven staff to break up a fight. But I don't see any imminent threat to New Orleans, not yet anyway. The protagonist of River Road, Drusilla Jaco or DJ, is female, and she's the only female character encountered. I like that DJ, as a wizard, is afraid of water. After 50 pages, I found these dissimilar books to be an even match. For me, there was no clear winner. This battle easily could have gone either way. Both books were entertaining. What eventually decided this battle for me, was that I could relate a bit better to DJ, a modern woman, than to characters based on famous men from over a century ago. River Road advances to the semifinals where it will take on The Rise of Ransom City by Felix Gilman. We begin the second round of Bracket Seven of the Battle of the Books, after a short delay due to the Windows XP apocalypse. Our first match in the second round features The Demoness of Waking Dreams by Stephanie Chong vs. The Rise of Ransom City by Felix Gilman. The winner will be the book I (Amy) most want to continue reading after 50 pages. 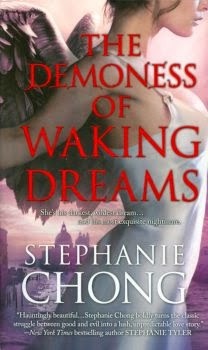 The Demoness of Waking Dreams: Harlequin MIRA paperback, August 2012, 259 pages. The Demoness of Waking Dreams is book two in the paranormal romance series The Company of Angels. In the first 25 pages of The Demoness of Waking Dreams we were introduced to the beautiful demoness Luciana Rossetti, who escaped home to Venice, Italy after her plans were foiled by the Company of Angels. Luciana hunts during the Festival of the Redeemer each year for a single victim to offer to the Prince of Darkness. We were also introduced to ruggedly handsome, Brandon Clarkson of the Company of Angels in Chicago. Before his death, Brandon was a police officer. Brandon is assigned to capture the dangerous Luciana, who has concocted a poison that can kill even demons and angels. Brandon works alone. Brandon peruses Luciana's file on his plane flight to Italy. When Brandon falls asleep, his recurring nightmare is invaded by Luciana and she tells him to turn back. Meanwhile, Luciana wakes from a brief reverie with a mysterious feather, after envisioning a man, undoubtedly Brandon. Later, Brandon finds Luciana easily, she's at the Redentore Church, as every year. Brandon thinks Luciana is stunningly beautiful. Luciana recognizes Brandon as an angel and she talks to him defiantly. He tries to handcuff her. Luciana runs. Brandon chases her through the streets of Venice. Luciana leads him to a narrow street called Rio Tera dei Assassini, a place that feels to Brandon of death. The Rise of Ransom City: Tor Books, November 2012, 366 pages. 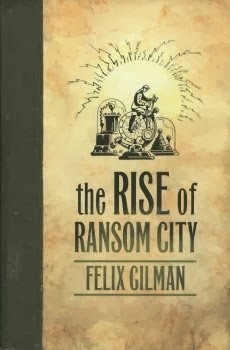 The Rise of Ransom City is Felix Gilman's fourth novel, and is a loose sequel to The Half-Made World. The Rise of Ransom City is the fictional autobiography of self-educated inventor and businessman, Professor Harry Ransom. It's set during the Great War between Gun and Line. The first 25 pages told of Harry's childhood in a coal mining town, and how Harry was cured of a mysterious illness by an electrical apparatus made by the Line. That apparatus inspired the prototype for Ransom's Light-Bringing Process. Professor Ransom and his assistant are traveling through towns on the Western Rim in a wagon with their apparatus seeking investors. After one of his demonstrations, Professor Ransom takes a late night stroll. He catches sight of two weary people walking along the road in the darkness, a younger woman and an older man. Professor Ransom introduces himself. The woman says that she's Miss Harper. Ransom asks the man if he's her father, and he nods. Ransom assumes they are avoiding the patrols of the Line for some secret reason, which he is curious to learn. Ransom offers to let them travel with him and his assistant. Readers of the previous book, The Half-Made World, will know who these characters actually are. Professor Ransom shows his Light-Bringing Process in another town, at a Smiler (a type of Church) meeting hall. His assistant initially works the pedals of the apparatus. There are magnetic cylinders and coils. Ransom's lamps start glowing. There are no connecting wires. This is not electricity. Ransom unwisely delivers, instead of his usual pitch of how the Process could make money for a canny investor, his opinions about the War. Then the Process becomes unbalanced, power surges into the Ether, and all the lamps burst. Ransom and his assistant barely manage to pull the emergency lever on the apparatus. Ransom says that he didn't know then how dangerous the Process could be. The Battle: This matchup is a battle between a paranormal romance featuring a demoness and an angel, and a steampunk fantasy set in an alternate world inspired by the Old West. The Demoness of Waking Dreams is, so far, entertaining. The setting in Venice is interesting. I liked that one of Brandon's first lessons as an angel was that beauty can be deceptive, and to not equate beauty with goodness. I found it difficult to believe that Luciana could find her way into Brandon's dream before they even met in person. How would she even know that he was coming after her? This is undoubtedly a paranormal romance. Brandon "falls" into Luciana's green eyes. The energy of their bodies is like a magnetic force. Pheromones are making a presence. I think I can guess where The Demoness of Waking Dreams is leading, but I'm not sure that I want to go there. To be honest, I don't usually read romance. The Rise of Ransom City is an old-fashioned tale told in first-person in rambling style which I happen to like, but some people might find somewhat long-winded. The writing contains quirky humor that seems patterned on that from over a century ago. Not all that much has happened yet, plot wise, and I'm unsure where the story is going, but I'd like to follow this adventure and learn more. I enjoy the world building, and the unreal, not fully explained, weird aspects. Professor Ransom comes off as eccentric, but likable. If you enjoy reading romance, maybe give The Demoness of Waking Dreams a try. But for me, after 50 pages, I'd prefer to continue reading the steampunk western. The Rise of Ransom City advances to the semifinals, where it will take on either The Doctor and the Rough Rider by Mike Resnick or River Road by Suzanne Johnson.